Can a 44 Year Old Stay in a Youth Hostel? Guests under 25 with backpacks? Check! We value our privacy in a big way. I wondered how we would manage shared space for a week. However we also knew that staying in a guesthouse would give us more visibility into Japanese culture than we’d ever learn on our own. And frankly, accommodations in Japan are pricey and our six nights at Kanazawa’s Pongyi guesthouse would help us right size our budget. 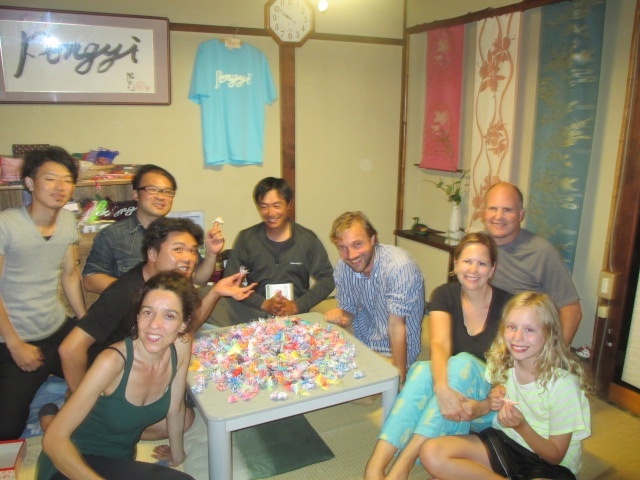 Sitting on the floor on thin cushions with guests from Singapore, Australia, Germany and Japan making paper cranes to take to a local shrine. 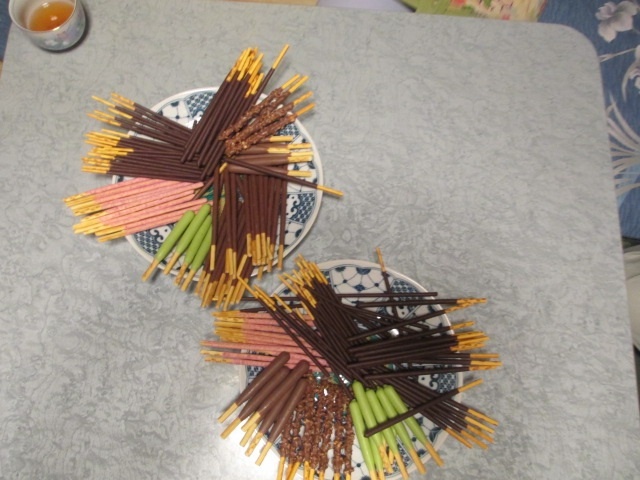 Gathered around for a Pocky (chocolate covered bread sticks) party with Pocky of all types…green tea Pocky anyone? Followed by a puppet show about the history of Kanazawa. A guest from Tokyo exclaiming “it’s my holiday!” and grabbing a beer to have with his breakfast shortly before he went to the kitchen and whipped up an unexpected breakfast for us of noodles, eggs and green onions…it was delicious! The same man caught us headed to bed for the evening…in our hands, just used toothbrushes and toothpaste. In his hands, a bottle of sake and three sake glasses insisting on toasting our visit to Japan. How could we refuse? The next day he showed up with bags of must try Japanese candy for the children. Our last evening, our host planned a Japanese menu that catered to our tastes (beef for Kyle, leeks for me, and fried chicken for the kids), took us shopping and showed us how to cook sukiyaki, a beef and vegetable dish. Sean and Julia set the table for nine and we sat down with guests from Singapore, Japan and France for a feast. As we ate, we learned more about each others cultures and our fondness for the Pongyi Guesthouse and its wonderfully warm and entertaining hosts, You and Maru, grew and grew. Were there a few uncomfortable bathroom moments, shower waits, and slightly obnoxious guests? Yes, of course. But our level of understanding of the Japanese cultures accelerated during our week in Kanazawa. And lord did we have fun! It’s interesting to think that had our budget allowed, we would have stayed in a nice hotel with a private bathroom…quietly and sadly alone. If I had to stay in a guest house, I would pick Japan too. It would be safe and clean friendly. I remember some guest houses from my stay in Thailand as a 20-something backpacker and they were so NOT. Actually the hostels in Japan were nice too. Yes, Japan was such a great place for us to start out and assess our comfort level. We leave for SE Asia on Tuesday and we’ll see how we get courageous with accommodations along the way! BTW, loved your Francisco Draisci post — we appreciate the modern aesthetic very much. 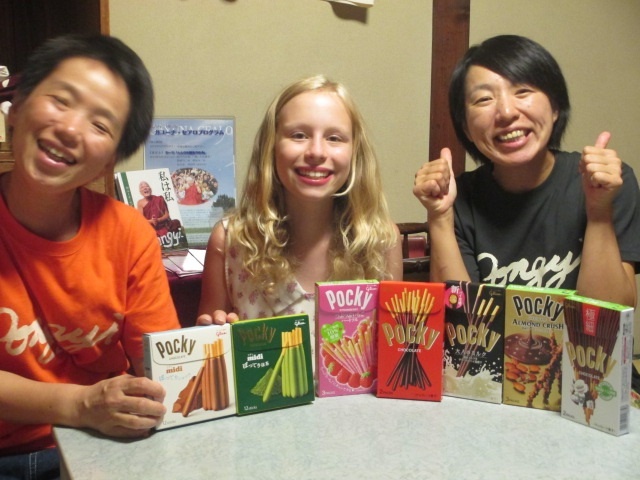 So happy that you got to mix it up with other travelers and local Japanese…being a bit uncomfortable is so worth it if you made friends. You’ll remember these special moments of connection more than any shrine or excursion. Beautiful writing Rachel…. I’m enjoying your blog and good for you guys for checking out the hostel scene! We were just commented the other day that we felt very removed from other people (be it locals or fellow travelers) during large parts of our trip. This was especially true in Europe and Turkey, when we were staying in private apartments. I agree that Japan is a good place to have that experience; we were turned away at some youth hostels because our kids weren’t over the age of 12. Jenn, I hadn’t even thought that the kids might be too young for some places…I wonder if we’ll run into that. I’ve had to convince people that they are 11 (most kid rates in Japan end at 12) — apparently they are tall by Japanese standards. Not sure if we’ll be as brave about hostels in SE Asia…fortunately the cost of accommodations there will allow us the privilege of our own bathroom. 🙂 Too funny how I think of that know as a privilege! Oh Karrie, we need to connect on homeschooling. I went in with such enthusiasm and its been the hardest part of the trip. We’re re-evaluating our approach right now but our biggest issue is that the kids want a REAL teacher, not their parents teaching them. I hope I can learn the right approach to help you down the line! Rachel, you are giving your kids the education of a lifetime. Estas cosas no se aprenden en ninguna Universidad. Rachel- I am enjoying checking out your blog, what a great time! Keep up the fun. Thanks, Rose! The was plenty of world travel amongst the grocery team to inspire me! Hope everyone is well!